Delicious GREENS 8000® is an easy mixing, great tasting and energizing "phyto-nutrient" powder mix loaded with certified organic, whole foods and plant extracts. These are the "Super-Foods" that the scientific experts and doctors tell us to eat daily, but we never seem to do with regularity. Delicious GREENS 8000® includes organic green plants, healthy herbs and spices, natural food concentrates and antioxidant rich fruits and vegetables. Delicious GREENS 8000® supplies an super blend of completely natural vitamins, flax lignans, ionic trace minerals, enzymes, antioxidants, phytonutrients and symbiotic intestinal flora for maximum energy, metabolism, fat burning, digestion, detoxification, immunity, repair, recovery, revitalization, and longevity. DELICIOUS GREENS 8000® is a marvel of modern nutraceutical science. It is the combined efforts of many different people, ideas and known nutritional facts. There is an ever growing body of evidence to support the fact that our bodies need green leafy vegetables and fruits everyday in order to maintain a disease free body. Delicious GREENS 8000 is the answer to this need. Drink Delicious GREENS 8000 every day and your body will love you for it. Good health to you! Chlorella: Numerous research projects in the USA and Europe indicate that chlorella can also aid the body in the breakdown of persistent hydrocarbon and metallic toxins such as DDT, PCB, mercury, cadmium and lead, while strengthening the immune system response. In Japan, interest in chlorella, and chlorella products has focused largely on its detoxifying properties -- its ability to neutralize or remove poisonous substances from the body. Spirulina: This tiny aquatic plant known as Spirulina, offers 60% all-vegetable protein, essential vitamins and phytonutrients such as the antioxidant beta carotene, the rare essential fatty acid GLA, sulfolipids, glycolipids and polysaccharides are also found in Spirulina. 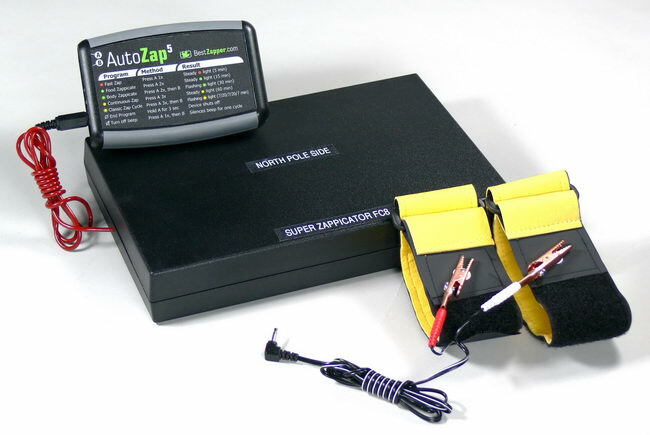 Provides maximum circulatory stimulation! 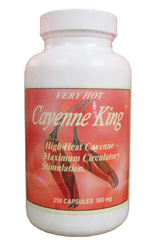 Cayenne King is formulated to stimulate circulation. Cayenne King is 80% 140,000 high heat cayenne, our unique blend of Indian red pepper, African Birdseye cayenne, and 20 percent ginger root. Start with one capsule just before or during your noon or evening meal. Do not take too much too soon. Increase dosage slowly. Most people take 1-4 capsules per day with food. (Cayenne King is too hot for most people starting out). Cayenne pepper capsules are easier and more tolerable for those who want the benefits of cayenne pepper without having to feel the heat. High heat cayenne contains more "capsaicin" (hot oil) than cayenne grown in the United States. Ingesting high heat cayenne with a meal helps prevent fibrin - that forms blood clots or blood "stickiness" - from building up in the blood. Herbs: East Indian and African Birdseye Cayenne, and Ginger Root. An all purpose cardiovascular formula containing equal amounts of high heat cayenne, garlic and hawthorn. 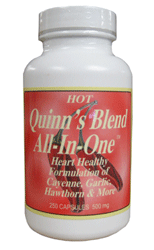 Quinn's is an excellent choice for people who want the three most important cardiovascular herbs all in one capsule. Cayenne pepper capsules are easier and more tolerable for those who want the benefits of cayenne pepper without having to feel the heat. Suggestion: Start with one capsule just before or during meal time. Increase dosage slowly. Most people take between 2 and 6 capsules per day. While cayenne is the best circulatory stimulant, garlic and onion add nutrition and cardiovascular cleansing. Flavonoid-rich hawthorn increases blood flow to the heart if taken for at least 3-6 months. Herbs: East Indian and African Birdseye Cayenne, Garlic, Hawthorn Berries, Blossoms and Leaves, Ginger Root and Onion. NOTE: The U.S. FDA has not evaluated these statements. This product is not intended to diagnose, treat, cure or prevent any disease. Our unique supplement provides 2000 international units (IU) of vitamin D3. Unlike any other vitamin D supplement, ours comes in a base of our wild Alaskan Sockeye Salmon Oil, which the independent Marine Stewardship Council certifies as sustainably harvested. Wild salmon are extraordinarily rich in vitamin D3 ... so our Vitamin D3 in Sockeye Salmon Oil offers a very natural way to supplement your diet with an essential nutrient that's also an exceptionally powerful health-promoter. In addition to vitamin D3, each small, easy to swallow 300 mg softgel provides 60 mg of omega-3s, including 46 mg of EPA+DHA. Our Vitamin D3 softgels also contain about 0.036mg of astaxanthin, the naturally occurring, powerfully antioxidant carotene pigment that gives our unrefined wild salmon oil its bright orange hue and protects it from oxidation. Ingredients: Wild Alaskan sockeye salmon oil, softgel capsule (fish gelatin, glycerin*, purified water), vitamin D3 (cholecalciferol). Contains no artificial preservatives, color, dairy, starch, wheat or yeast. Product has been sealed for your protection. Do not use if seal on cap is broken. Store in a cool, dry place. Adults can take one softgel daily, preferably with a meal, or as recommended by a healthcare professional. Keep out of reach of children. The U.S. recommended daily allowances (RDAs) for vitamin D are 200 IU (birth to age 50), 400 IU (age 51-70) and 600 IU (age 71-plus). Substantial peer-reviewed evidence supports leading researchers' recommendations that the U.S. Institute of Medicine raise the U.S. RDAs substantially. In October of 2008, the American Academy of Pediatrics (AAP) recommended a doubling of the RDA* for infants, children, and adolescents, from 200 IU to 400 IU. To help ensure optimal health, most researchers involved in vitamin D studies recommend minimum blood levels ranging from 90 to 120 nmol/L (36 to 48 ng/mL). However, normal human blood levels* of vitamin D extend above 200 nmol/L or 80 ng/mL. Though the official upper intake limit is now 2,000 IU per day, vitamin D intake is proven safe* at a daily intake level of 10,000 IU ... which is 25 times the current RDA for adults 51 or older (400 IU). Most experts say that the evidence supports a daily intake of at least 1,000 IU via food and supplements, and most prefer an intake of 2,000 IU to 4,000 IU per day*. This intake level applies to all people, but is especially advised for darker skinned people who spend less than 30 minutes per day in strong sunlight. Darker skinned people, whose greater amount of skin pigment blocks the UV rays that make vitamin D, need more sun exposure. These statements have not been evaluated by the US Food & Drug Administration (FDA). This product is not intended to treat any health condition. Vieth R. Why the optimal requirement for Vitamin D3 is probably much higher than what is officially recommended for adults. J Steroid Biochem Mol Biol. 2004 May;89-90(1-5):575-9. Review. Heaney RP. Vitamin D in health and disease. Clin J Am Soc Nephrol. 2008 Sep;3(5):1535-41. Epub 2008 Jun 4. Mag O7 is a specially formulated magnesium based compound which has been ozonated and stabilized to release nascent oxygen when used as directed. 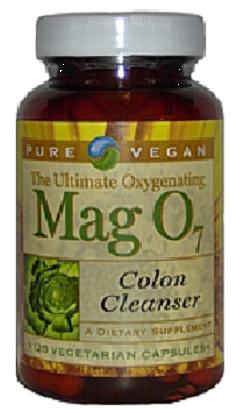 Mag O7 has a stool softening effect, which eliminates the digestive tract of unwanted debris. Mag O7 aids the digestive process by slowly releasing beneficial nascent oxygen which helps friendly bacteria utilize nutrients efficiently. Mag O7 is non-habit forming. Other Ingredients: Citric Acid, Rice Flour & Vegetable Capsules. Suggested Usage: As a dietary supplement, take up to 5 capsules at bedtime, on an empty stomach for 7-10 days or until desired cleanse has been attained. Decrease dose for maintenance. Daily dosage will vary depending on individual and intended purpose. Results may vary. Caution: The magnesium in this product is intended to be an oxygen delivery mechanism for the purpose of colon cleansing and general colon health. This product is not intended to be used as a magnesium supplement. Store in a cool dry place. Keep out of reach of children. Following a regimen of Pure Vegan Mag O7 it is advisable to take a probiotic supplement in order to re-establish the beneficial flora of the colon. Mag 07 is an ozonated magnesium that has been stabilized to release oxygen for 12 hours or more. The timed release ensures that Mag 07 will provide an adequate amount of oxygen, slowly, for better utilization. How does Mag 07 work? When Mag 07 comes into contact with natural stomach juices, it begins to slowly release oxygen. 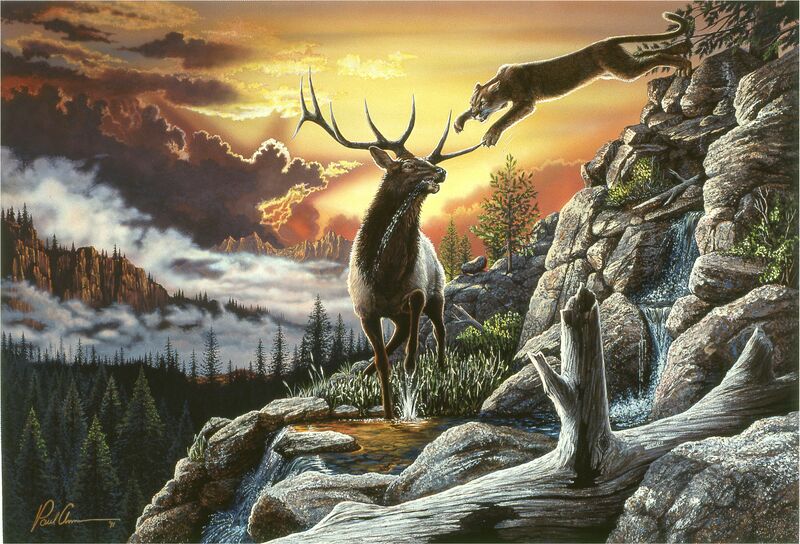 The release of oxygen continues throughout the digestive system. The magnesium acts as a vehicle to transport the oxygen throughout the body and has a gentle stool softening effect. This magnesium is in a complex oxide form and very little is assimilated by the body. It passes through the intestinal tract, kidneys and bladder, helping to cleanse by delivering oxygen along the way. Therefore, it is the perfect vehicle for transporting the oxygen. Mag 07 offers a number of benefits to its users. However, everyone is unique and the effects of Mag 07 will vary depending upon the individual. Mag 07's stool softening effect helps to loosen intestinal build up which aids in the release of unwanted waste materials and toxic substances that may be present. A build up of intestinal waste may cause an overgrowth of BAD bacteria. Mag 07's slow release of oxygen creates an inhospitable environment for anaerobic bacteria and other toxic matter. Oxygen also supports the good flora, which are essential for proper digestive and intestinal health. Mag 07 is formulated to release oxygen for 12 hours or longer. Some of the competitors' products claim to release oxygen, but fail in comparison. Mag 07 comes in both powder and capsule forms, both of which are highly effective. Mag 07 contains citric acid, which prompts the release of oxygen, where some competitor's products contain antioxidants as an ingredient. An oxygen cleanse product should never contain ascorbic acid (Vitamin C) or any antioxidant as it neutralizes the oxygen released making the product ineffective. Why You Should Choose Mag O7? 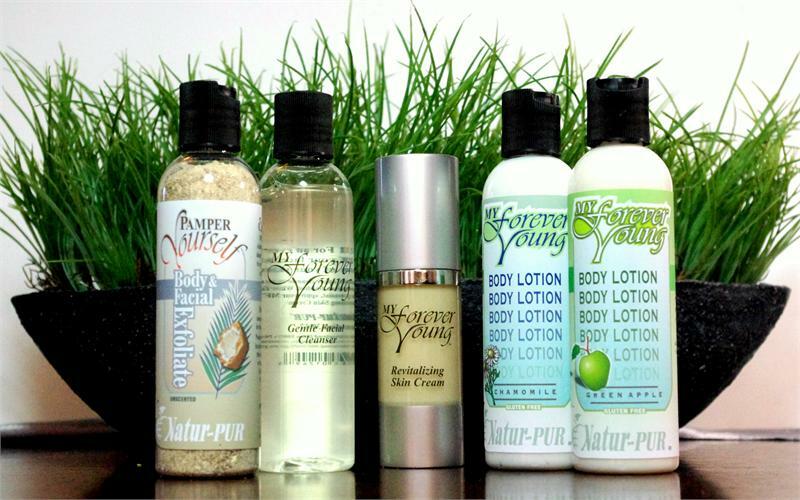 When considering an oxygen cleansing product, there are, no doubt, many from which to choose. When looking for a high quality oxygen cleanser, consider the following: Does the product actually release Oxygen? Aerobic Life guarantees oxygen release! Laboratory tests on MAG 07 (iodometric titration) ensure product integrity, quality control, and consistent oxygen release. In order to provide a stable environment for oxygen atoms, they must be bound to a stabilizing compound. It is important to choose an oxygen product that has stabilizers that provide a stable environment and allow for a controlled release of oxygen. 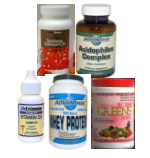 For over 35 years, Aerobic Life's mission has been to provide the best healing and preventative methods, including educational materials, for our unique, high quality products to those who seek a natural and an alternative approach for their health care needs. We seek to raise the level of satisfaction and quality of life for our customers. 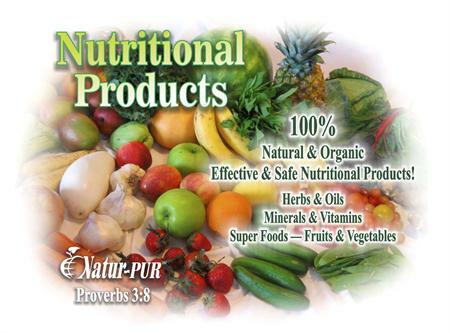 We dedicate ourselves by offering our customers only the highest quality products and service within the natural health industry. It is our promise! Amylase, Protease I, Protease II, Lactase, Lipase, Cellulase, Maltase & Hemicellulase. Amylase enzyme helps break starch down into sugar. Amylase is present in human saliva, where it begins the chemical process of digestion. Plants and some bacteria also produce the amylase enzyme. Lipase enzymes help the absorption and digestion of nutrients in the intestines. Lipase Enzymes are responsible for breaking down of fatty substances. Other Lipase supplements are usually derived from animal enzymes; Pure Vegan Digestive Enzyme Complex is derived from Plant based enzymes. Unlike most digestive enzyme supplements, this proprietary blend works continuously throughout the pH variations in the digestive tract. Specifically, Pure Vegan Digestive Enzyme Complex helps increase the digestion of foods and helps enhances the bioavailability of dietary supplements. 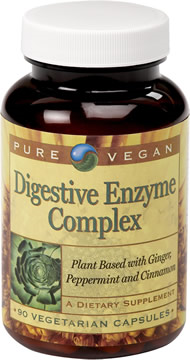 Pure Vegan Digestive Enzyme Complex also contains Ginger, Cinnamon, & Peppermint. Ginger is perhaps the best herb for digestion. It helps break down proteins to rid the stomach and intestinal gas. It also aids in the digestion of fatty foods. Cinnamon aids in digestion and is energizing. Peppermint promotes healthy digestion by soothing and comforting the stomach. Peppermint also helps improve the flow of bile from the liver to the gallbladder. Peppermint Leaf - 15 Mg.
Other Ingredients: Rice Flour and Vegetable Capsules. Digestive Enzymes may help with heartburn, gas, bloating & indigestion. Digestive enzymes may also enhance the adsorption of dietary supplements. The synergistic blend of ginger, cinnamon & peppermint may calm indigestion and bloating. As a dietary supplement, take 1-2 capsules before each meal or as directed be a health professional. Many of us automatically think "bad" when we think of "bacteria." After all, if bacteria form a parasitic association with other organisms, they are classed as pathogens. Pathogenic bacteria are a major cause of human disease and infections. 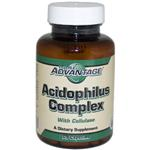 Yet probiotics such as acidophilus are considered beneficial and are sometimes referred to as "friendly" bacteria. Some of the ways they are thought to promote health include suppressing the growth of potentially harmful bacteria, improving immune function and enhancing the protective barrier of the digestive tract. The digestive tract is host to about 400 different kinds of bacteria and yeasts. Among these, Lactobacillus acidophilus B. bifidum, and B. longum and other members of the Lactobacillus family are especially important to your health. These strains of bacteria are considered "pro-biotic" bacteria since they help maintain intestinal health, and serves as a natural antibiotic against potentially harmful organisms. Pure Advantage probiotics are non-dairy, carefully cultured human strains for proven and effective human intestinal adherence and colonization. Pure Advantage are heat stable and thus don't require refrigeration as finished products. Pure Advantage Probiotic Complex have a long shelf life (3 to 4 years as finished products) and are guaranteed stable through expiry following proper storage and handling procedures. Take two capsules (one hour before breakfast) and one at bedtime (two hours after eating), until optimum intestinal health is achieved. One capsule before bedtime should be used as a maintenance dose. This product should be taken on an empty stomach. Probiotic blend (providing 1.5 billion organisms at the time of consumption prior to expiration) Lactobacillus acidophilus, Bifidobacterium bifidum, Bifidobacterium longum. Digeseb Plus is a proprietary blend of acid stable plant-based enzymes supplying (Amylase, Protease 1, Protease 2, Lipase and Cellulase) for enhanced bioavailability. Pure Vegan Vitamin B12 Methylcobalamin Spray - 500 mcg Spray - 1 fl. Oz. 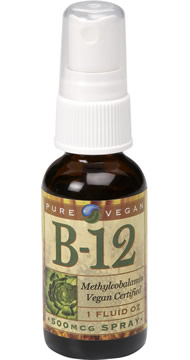 Pure Vegan's Vitamin B12 Methylcobalamin Spray is a cut above other vitamin B12 products since it's in the methylcobalamin form. Methylcobalamin is the most absorbable form of vitamin B12. This is extremely important when taking a vitamin B12 supplement, especially for a vegan diet. Since B12 is found mainly in meat sources, a vegan diet is often deficient in this important daily vitamin. Other Ingredients: Purified water, vegetable glycerine, & potassium sorbate. 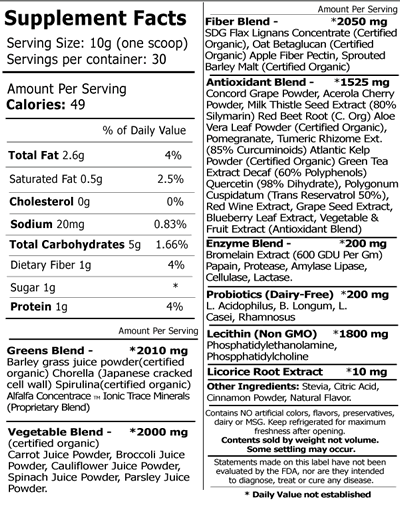 Does not contain any dairy, egg, sugar, corn, yeast, wheat, soy, or glutens. 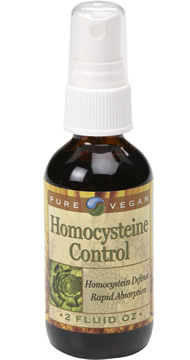 Pure Vegan Homocysteine Control Spray is a unique, orally administered, fast-acting formula that may support the cardiovascular system by maintaining normal homocysteine levels. Homocysteine is a toxic amino acid formed in the body when other amino acids in your blood are broken down by normal body processes. High blood levels of homocysteine have been linked to a higher risk of heart and vessel disease, and are considered even more of a threat to heart health than high cholesterol. In addition, high levels of homocysteine combined with excessive serum cholesterol can damage the cardiovascular system. Recent studies have shown that elevated homocysteine levels may be an independent risk factor for the development of heart disease, brain disease and stress. Homocysteine also damages cells that line the veins or arteries and stimulates the development of scar tissue in the damaged area. Ingredients found in Pure Vegan's Homocysteine Control Spray are Trimethyl Glycine (TMG), vitamins B6, B12 (Methylcobalamin) and folic acid. These key nutrients may help convert homocysteine to other substances, thus preventing an unwanted buildup of homocysteine. Vitamins B6, B12 and folic acid must be obtained from food or supplementation because, like other vitamins, the body cannot make these essential substances from other nutrients. Suggested Use: Shake well. As a dietary supplement, pump 5 sprays per day into mouth and swallow, or as directed by a health care professional. Folic Acid USP - 400 mcg, B6 (as Pyridoxine HCL) - 10 mg., B12 (as Methylcobalamin) - 1000 mcg, TMG (Trimethyl Glycine), 10 mg.
Other Ingredients: Purified water, vegetable glycerine, natural fruit punch flavor, & potassium sorbate. Does not contain any dairy, egg, sugar, corn, yeast, wheat, soy, or glutens. Glutamine is the most abundant amino acid found in your muscles. It is also the primary transporter of nitrogen into your muscle cells. Glutamine plays key roles in protein metabolism, cell volumizing, and anti-catabolism. Glutamine's anti-catabolism ability prevents the breakdown of your muscles. Research also indicated that Glutamine increases the body's ability to secrete HGH, which helps metabolize body fat and support new muscle growth. 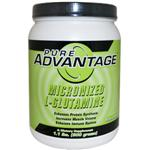 Pure Advantage only uses Micronized, Pharmaceutical Grade L-Glutamine which means better absorption and utilization. 100 lbs. - 150 lbs. - Mix 1 heaping scoop (5 grams) with your beverage of choice 45 minutes before and immediately after exercising. 151 lbs. - 250 lbs. - Mix 2 heaping scoops (10 grams) with your beverage of choice 45 minutes before and immediately after exercising. 251 lbs. - Up - Mix 3 heaping scoops (15 grams) with your beverage of choice 45 minutes before and immediately after exercising. Ingredients: Micronized L-Glutamine (U.S. Pharmaceutical Grade). Nothing else added. Warnings: As with any dietary supplement, please consult a physician before consuming this product. Keep out of reach of children. Store in a cool, dry place. Serving scoop included, but may settle to bottom during shipping. Through extensive research and development, the makers of Pure Advantage™ can offer consumers a 100% Natural Whey Protein with all the benefits of a great tasting, low-fat, low-carbohydrate protein without unwanted artificial or synthetic ingredients. Formulated only with natural flavors and sweeteners, 100% Natural Whey Protein gives your body the optimal benefits of whey protein while providing a ratio of essential and non-essential amino acids. This new formulation promotes accelerated recovery time, boosts immunity and supports intestinal health. 100% Natural Whey Protein is a creamy, natural protein shake, formulated for easy mixing without a blender, available in vanilla and chocolate. Until now, it was hard for consumers to purchase a natural protein shake without sucralose, ACE-K, aspartame or other artificial sweeteners. Pure Advantage™ remedied this problem with the use of stevia. Bioactive whey compounds (Advantage Plus™), ion-exchange whey protein isolates, cross-flow micro-filtered whey protein isolates, ultra-filtered whey protein concentrates and hydrolyzed whey peptides. The use of these different proteins removes virtually all of the cholesterol and lactose, making it ideal for low fat, low-carbohydrate and lactose intolerant diets. 100% Natural Whey Protein contains key amino acids, which provide the building blocks to manufacture hormones and proteins, while maintaining healthy hair, skin and nails. Advantage Plus™, the key ingredient in the protein matrix, contains immunoglobulins and lactoferrin. Immunoglobulins are our body's natural defense proteins, which function as antibodies in the immune response. Lactoferrin is a potent immune modulator that demonstrates antibacterial activity against disease, and will actually support the growth of (good) bacteria in our digestive system. 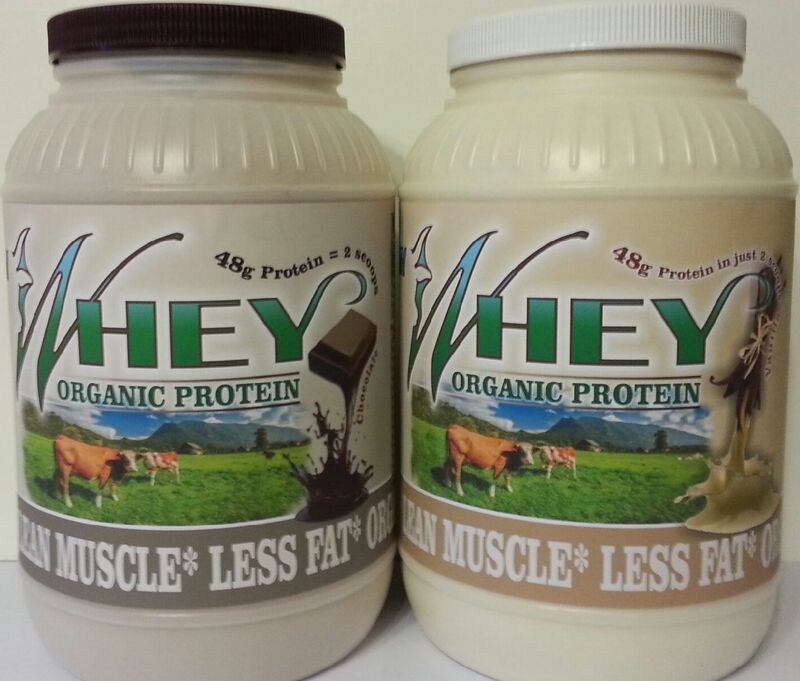 100% Natural Whey Protein is used by people of all ages. It is a great source of protein for low carbohydrate dieters, athletes, children or anyone who feels the need to add more protein in their diet. Since it can be mixed with a spoon or shaker cup, 100% Natural Whey Protein can be made into a rich and creamy shake virtually anywhere, eliminating the need for hand-held or bulky blenders. Mix one heaping scoop (scoop included) of Pure Advantage's Whey Protein Complex with 4-6 oz (depending on desired consistency) of your favorite beverage. For best results, take 2-3 servings per day or as directed by a physician or certified nutritionist. ‡ The Tryptophan in this product is naturally occurring. 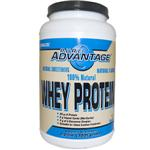 Advantage Plus Protein Blend [Bioactive Milk Compounds (Microlactin), Ion-Exchange Whey Protein Isolates, Cross Flow Micro-filtered Whey Protein Isolates, Ultra-filtered Whey Protein Concentrates, Hydrolyzed Whey Peptides and Glutamine Peptides], Guar Gum, Fructose, Natural Flavors and Stevia. Contains absolutely no artificial flavors or sweeteners. Vitamin D is synthesized in the body from sunlight. But, due to the winter season, weather conditions, and sunscreen blockers, the body's ability to produce optimal vitamin D levels may be inhibited. In fact, it has been proposed that annual fluctuations in vitamin D levels explain the seasonality of influenza. All of these factors point to the value of taking a daily vitamin D supplement to ensure optimal vitamin D intake. Vitamin D has long provided significant support for healthy bone density. However, scientists have also validated the critical role that vitamin D plays in regulating healthy cell division and differentiation, and its profound effects on human immunity. These findings link a deficiency of vitamin D to a host of common age-related problems. The current RDA is only 400 IU. As a result of startling evidence of a widespread vitamin D deficiency, prominent nutritional scientists are calling on Americans to increase their vitamin D intake to 1000 IU per day and higher. Currently, most experts in the field believe that intakes of between 1000 and 4000 IU for adults will lead to a more healthy level of serum 25(OH)D, at approximately 75 nmol/L. Life Extension® recommends that healthy adults supplement each day with at least 1000 IU of vitamin D. Elderly adults may benefit from higher doses such as 2000 IU daily, and even up to 5000 IU daily. 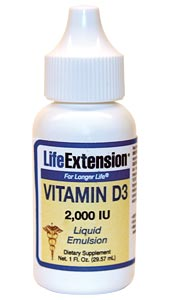 For individuals with greater vitamin D needs or those looking to take fewer capsules, one drop of Vitamin D3 Liquid Emulsion conveniently provides 2,000 IU of vitamin D3 (cholecalciferol), a form of the vitamin that is structurally similar to that derived from sunlight on the skin. Other Ingredients: Vegetable Glycerin, deionized water. This product contains No milk, egg, fish, peanuts, crustacean shellfish (lobster, crab, shrimp), soybeans, tree nuts, wheat, yeast, gluten, corn or rice. Contains No sugar, artificial sweeteners, flavors, colors, or preservatives. Take one drop daily with a fat containing, low fiber meal, or as recommended by a healthcare practioner. Note: The number of drops may vary based on temperature and altitude. If you have a bad reaction to product, discontinue use immediately. When using nutritional supplements, please consult with your physician, if you are undergoing treatment for a medical condition or if you are pregnant or lactating.